The above quoted is for per piece price, with minimum purchase of 25 pcs or more PAMP Suisse Lady Fortuna 5 gram Gold Bars (With Veriscan®). 5 gram .9999+ Fine PAMP Gold Bars contain 5 gram of Gold. Each is individually serial numbered and comes with the original assay card. 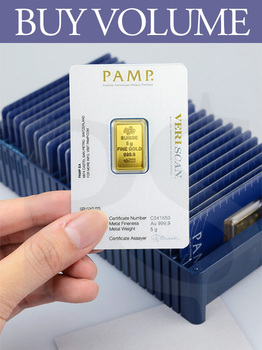 PAMP Suisse bars offer the discerning investor an opportunity to own gold that is affordable, beautiful, and their value gains even more security with new Veriscan® technology that helps ensure the bar's origin when buying on the secondary market. This Box of 25 x 5 gram Gold Bars of .9999 fine gold make for a great way to store fractional bullion, and it can be used as birthday, graduation or corporate anniversary gifts. 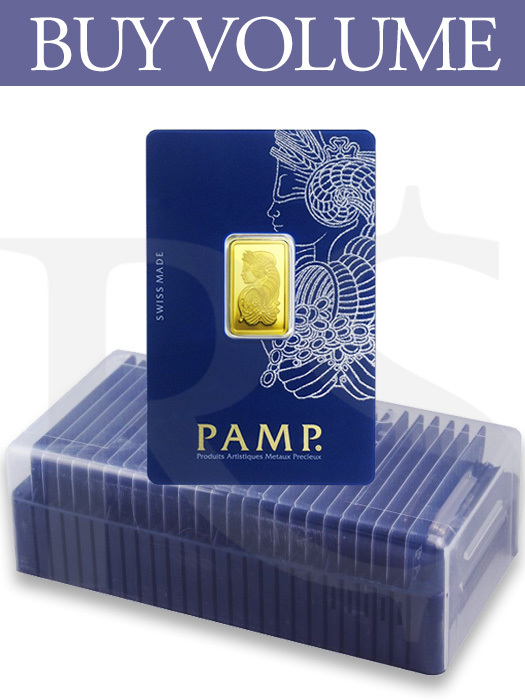 All PAMP Suisse Gold Bars ship with their respective assay cards and PAMP Suisse Lady Fortuna 5 gram Gold Bar measures 22.1mm x 13.1mm with thickness of 0.90mm.